Penn State hockey coach Guy Gadowsky talks to his players during a recent game. On Saturday night, a hockey game will be played at the Wells Fargo Center. And, in a rare turn of events, fans cheering on the team in orange and black will be among the minority. That's because the team in orange and black won't be the Philadelphia Flyers. It will be the Princeton University men's ice hockey team. And to find out the reason their fans will be in the minority, look no further than the team opposite them for this weekend's Philadelphia College Hockey Faceoff (7 p.m.). Of course, he can always just tell his players those wearing orange and black are Flyers, not Princeton, fans. “I think I’m going to steal that from you,” he said with a laugh. Penn State, who recently reached No. 1 in the USCHO rankings for the first time in school history before falling to Ohio State this past weekend, is still in its infancy as a Division I hockey program. Prior to the 2012-13 season, Gadowsky's second at the helm, the team played in the ACHA, not the NCAA. They then spent one year as an independent Division I program before joining the Big 10 for the 2013-14 season. In Year 1, Penn State finished an 8-26-2 overall record, good for 6th place in their conference. The next year, the Lions improved to 18-15-4 and finished in 4th place. Last season, they jumped to third place with a 21-13-4 record. This season, Gadowsky's team is 16-3-2, in second place in the Big 10 behind Minnesota, and is currently ranked fourth in both the USCHO and USA Today polls. That's a long way to climb so quickly, no matter the sport. As recently as 2010, it was still unknown whether or not the University would even be able to make the jump to Division I hockey. And, as it turns out, they owe a bit of gratitude to their opponent this weekend. 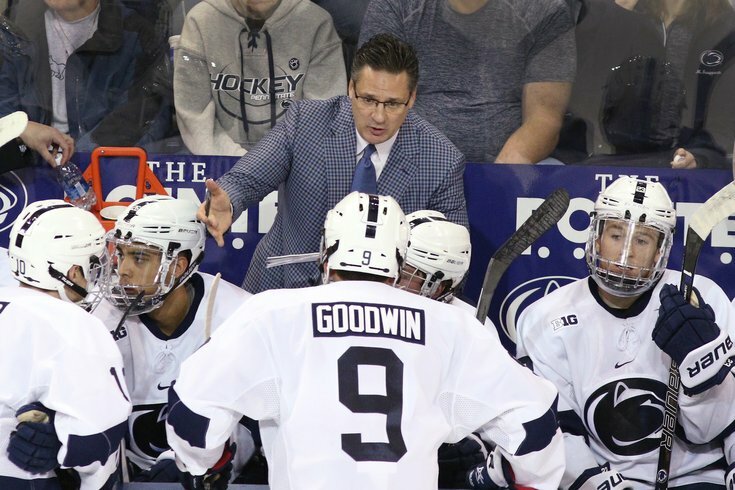 It's been almost six years since he made the move from Princeton to State College, but Gadowsky still sees some similarities between his current team and his former team. “Well, they’re a team on the rise right now," he said. "They have a good feeling because they’ve had as much success here recently as they had in the previous few years. So they’re feeling pretty good about themselves and they’re playing at the Wells Fargo. We spoke with Gadowsky at length about his team's rapid rise, what made that possible, and how he plans to continue this success moving forward. Here's more from the Penn State coach. PhillyVoice: When you took over at Penn State in 2011, did you think a No. 1 ranking would be possible by your fourth season in D-I? How has that success helped with recruiting? How important is having a strong recruiting base in the Philly area (and the rest of PA, NY, NJ)? “Absolutely. I hear that all the time from coaches and parents. I hear that all the time. And this gift by the Pegulas for this arena was not just for the varsity teams on campus. This was for all the hockey players in the Center County region. So it’s been great for youth hockey here and motivational for the program. There are a lot of people that love Penn State all around Pennsylvania and even a little beyond, and to have a Division I program that’s playing in the BIG 10 and having success is just that much more motivation for these players to love Penn State and love hockey. Have you been following what Dave Hakstol’s been doing with the Flyers? “Oh, a lot. We’re actually from very close to one another in the Edmonton area. So we grew up aware of each other and I’ve followed his coaching career. He did a tremendous job at North Dakota and he’s someone I consider — you know, when I have questions — to be a great coaching resource." Now that you’ve reached a No. 1 ranking, is winning the title a realistic expectation? Is that the next step for you guys?